Police have unveiled a new device to detect when motorists are using their mobile phones while driving.Hampshire and Thames Valley police forces are the first to use the new technology capable of determining how many cars on a stretch of road have phones being used without hands-free kits. Created by technology firm Westcotec, the device spots a phone being used, and flashes a mobile phone symbol at the vehicle to advise the driver to stop using their mobile phone. It can also enable police to identify hot spots where mobile phones are frequently used by motorists. The new device will be first used on the A34 in Oxfordshire before being used across the Thames Valley and Hampshire areas. We welcome this technology as it will hopefully make drivers think about what they are doing behind the wheel, and encourage some to put down their phones and concentrate fully on driving. 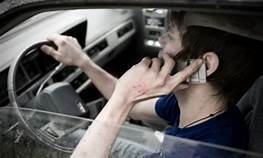 “We have made the Department for Transport aware of this.”RAC road safety spokesman Pete Williams said: “Driving and using a handheld phone do not mix, it is an incredibly dangerous and distracting combination. he campaign is being supported by Kate Goldsmith who lost her daughter Aimee Goldsmith after a lorry driver crashed into the car she was a passenger in while he was using his mobile phone to change music whilst driving. The 11-year-old was killed along with her stepbrothers Josh Houghton, aged 11, Ethan Houghton, aged 13, and the brothers’ mother Tracey Houghton, aged 45.